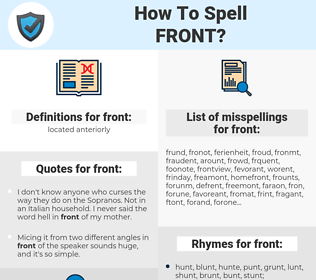 What are the misspellings for front? 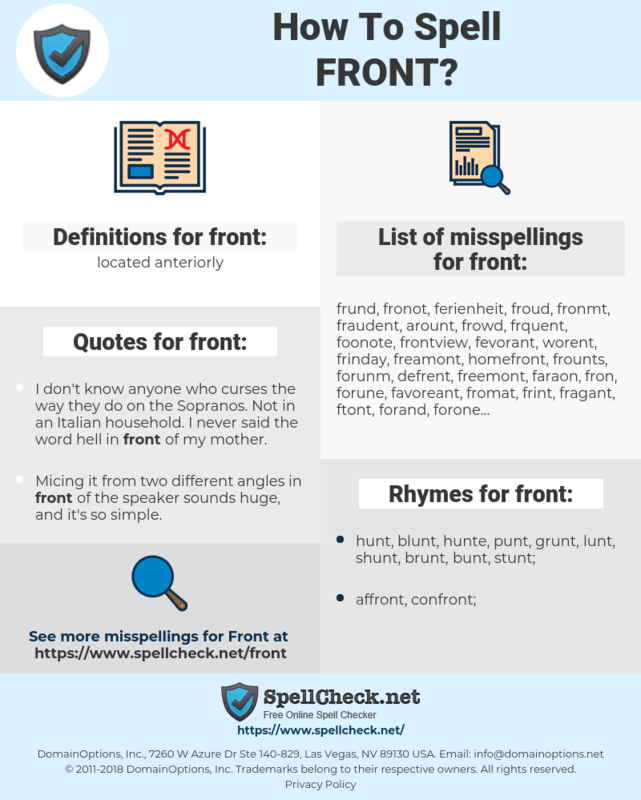 What are the common mistypes for front? What is the definition of front? What are the quotes for front? What are the rhymes for front? What are the translations for front? What are the common typos for front? This graph shows how "front" have occurred between 1800 and 2008 in a corpus of English books. 前面, 前端, 前置, 近前, 战线, 前边, 前面的. voorkant, voorzijde, voorgevel, voorste gedeelte. Anfang, vordere, Brust, Fassade, Vorderseite, Front, Vorder-, vorne, Vordergrund, Stirnseite, Frontseite, Vorderfront, Stirn, frontal. davanti, facciata, fronte, frontale, parte anteriore, anteriore. フロント, 正面, 前部, ぜんとうぶ, さいぜんせん, 最前戦, 前頭部, 前の. przód, czoło, przedni, czołowy, frontowy. dianteiro, parte dianteira, frontais, dianteiras. фасад, передний, лицевой, перед, фронтовой. portada, tapadera, materia, principio, frontera, frente, delantera, parte delantera, fachada, delantero, anverso, pechera.